The Ramsar site “Complejo Llanganati”, located in the Llanganates National Park consists of 11 distinct wetland systems and more than 100 lakes (Izurieta et. al. 2008). Nevertheless, additional wetlands within the National Park were left out of the Ramsar declaration despite their importance in terms of biodiversity and water resources. 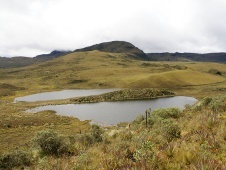 Therefore, by working together with the Ramsar focal point in Ecuador, the BirdLife partner and conservation NGO, Aves y Conservación have identified new wetlands to be included in the Llanganati Ramsar site. Exploratory field trips were implemented in the wetland systems of Yurac Patu and Piscacocha in 2012 and 2013, respectively, located outside the Ramsar site “Complejo Llanganati”. These expeditions were coordinated with the National Park office and the Ramsar focal point in Ecuador at the Ministry of the Environment. Both wetlands are important for resident and migratory waterbirds with a total of 11 species of waterbird recorded, the most abundant being Andean Teal Anas andium, with 49 individuals. Migratory species, such as Greater Yellowlegs Tringa melanoleuca, Lesser Yellowlegs Tringa flavipes, Spotted Sandpiper Actitis macularius and Baird’s Sandpiper Calidris bairdii were also observed using these wetlands as overwintering sites, although in smaller numbers. Additionally, species of large threatened mammals were found in the Yurac Patu area, including Spectacled Bear Tremarctos ornatus and Mountain Tapir Tapirus pinchaque. Both sites were found to be of great importance in terms of water resources, both for irrigation and hydroelectricity. The identification and exploration of these two wetlands has been made possible through joint efforts with the Ramsar focal point since 2012. Talks have also started on a possible extension of the Ramsar site to include these areas, given that the wetlands meet criteria 1, 2 and 3 for identifying wetlands of importance within the Ramsar Convention (Ramsar 2005). 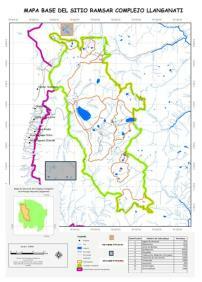 The area of Yurac Patu is well conserved, but the Piscacocha area suffers greater threats, such as drainage into the Salayambo reservoir (for production of hydroelectricity) located to the west of the wetland complex. This drainage puts the ecosystems services and ecological integrity of the site at risk. Ramsar (2005) Los Criterios para identificar humedales de importancia internacional. Documento Informativo Ramsar N°5.